This is the first book to be published on one of the greatest American designers of the 20th Century, who was as famous for his work in film as for his corporate identity and graphic work. With more than 1,400 illustrations, many of them never published before and written by the leading design historian Pat Kirkham, this is the definitive study that design and film enthusiasts have been eagerly anticipating. Saul Bass (1920-1996) created some of the most compelling images of American post-war visual culture. Having extended the remit of graphic design to include film titles, he went on to transform the genre. His best known works include a series of unforgettable posters and title sequences for films such as Alfred Hitchcock's Vertigo and Otto Preminger's The Man With The Golden Arm and Anatomy of a Murder. He also created some of the most famous logos and corporate identity campaigns of the century, including those for major companies such as AT&T, Quaker Oats, United Airlines and Minolta. His wife and collaborator, Elaine, joined the Bass office in the late 1950s. Together they created an impressive series of award-winning short films, including the Oscar-winning Why Man Creates, as well as an equally impressive series of film titles, ranging from Stanley Kubrick s Spartacus in the early 1960s to Martin Scorsese s Cape Fear and Casino in the 1990s. 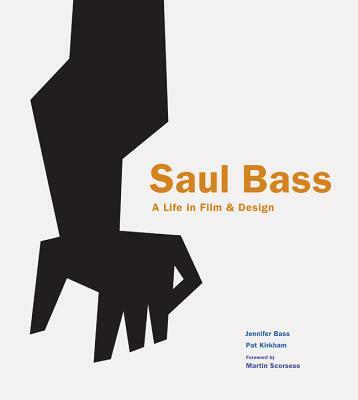 Designed by Jennifer Bass, Saul Bass's daughter and written by distinguished design historian Pat Kirkham who knew Saul Bass personally, this book is full of images from the Bass archive, providing an in depth account of one of the leading graphic artists of the 20th century. Jennifer Bass is a graphic designer and artist. She has worked at CBS Television in New York and at Sussman/Prejza & Company in Los Angeles. In 1994, she and her husband, Lance Glover, opened their studio, Treehouse Design Partnership in Los Angeles, working in the areas of environmental graphics, identity and book design. Pat Kirkham is Professor in the History of Design, Decorative Arts and Culture at the Bard Graduate Center for Studies in the Decorative Arts, Design & Culture, New York. She has written and edited a number of books, including Charles and Ray Eames (1998) and Women Designers in the USA 1900-2000 (2001). Saul Bass, best known for transforming the way movies begin, was in fact a designer of incredible versatility. As design historian Pat Kirkham shows in his forthcoming book on Bass (co-authored with Bass' daughter Jennifer), the legendary "visual communicator" also applied his graphic wizardry to album and book covers, typefaces, packaging, retail displays, a hi-fi system, toys and a postage stamp. "Surely Bass already has a monograph--he must. But he didn't, until now.....Today, everyone claims to be a multidisciplinary designer, but Bass was one of the first to be commercially successful at it--45 years ago." "...the first major book on his work....the book paints an engaging picture of Bass as a vigorous, highly disciplined man with a gift for friendship and sense of fun." --The New York Times, and this same review by Alice Rawsthorn also appeared in the INTERNATIONAL HEARLD TRIBUNE.